OMG Posters! » Archive A New Poster and Art Print by Jermaine Rogers (Onsale Info) - OMG Posters! I know a few people have been waiting for this new one from Jermaine Rogers, looks like you’ll get your chance later this week. 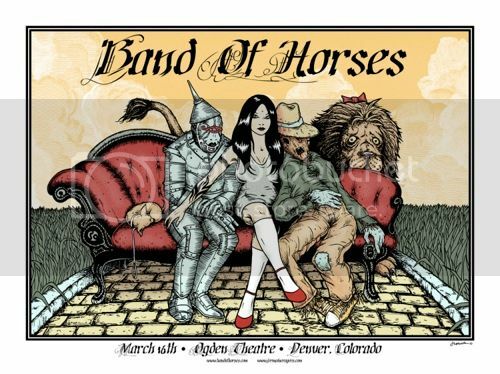 His Band of Horses poster is a huge 22″ x 32″ screenprint, has an edition of 75, and will be $50. The art print version, “This Yellow-Brick-Road Goes Nowhere” is a 22″ x 32″ screenprint, has an edition of 50, and will also be $50. These two prints go up Thursday, April 1st at 4pm EST. There will also be a very rare foil version of the art print (limited to 20) offered via Jermaine’s Facebook page on Thursday, April 1st at 3pm EST. For more info, visit JermaineRogers.com. What–no love? Reminds me of my years in Kansas (nope, I’m not in KS anymore). Great print w/ several variants. Can’t wait to see the “defaced” one!